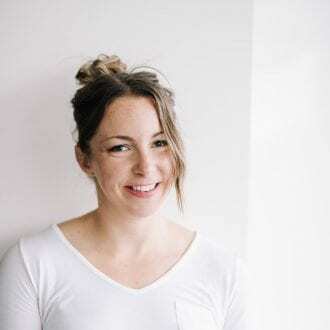 Today I’m sharing my favourite recipe from Bold Flavored Vegan Cooking: Healthy Plant-Based Recipes with a Kick by Celine Steen. 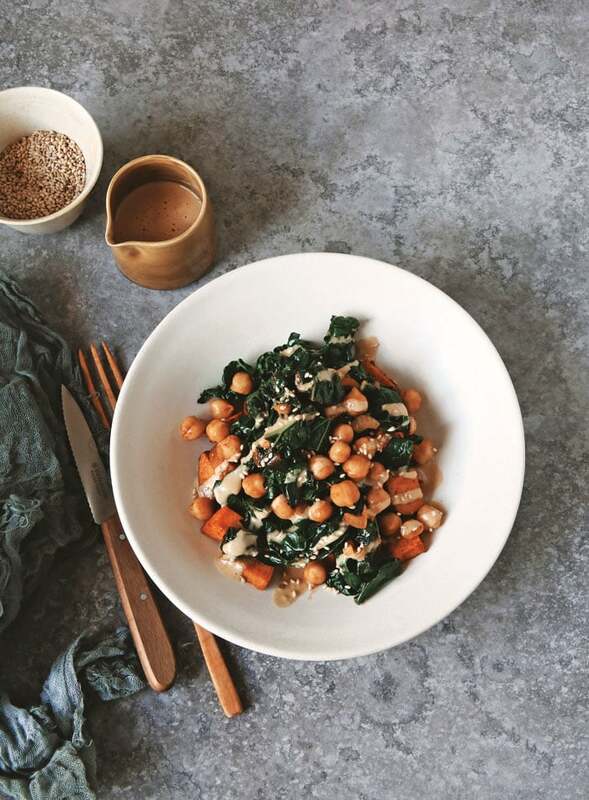 It’s a Kale and Chickpea Stir-Fry with Miso Peanut Sauce and it’s delicious, easy to make and can be paired up with veggies, rice, noodles or roasted sweet potato. The recipes in this book do not joke around. If you love bold, Japanese, Korean, Thai, Indonesian and other Asian flavours, you will love this book. Using different spices, umami-rich ingredients and interested cooking techniques, this book will make sure you never eat another bland or boring meal again. Caramelization. Roasting, searing and grilling fruit and veggies to bring out there flavour. 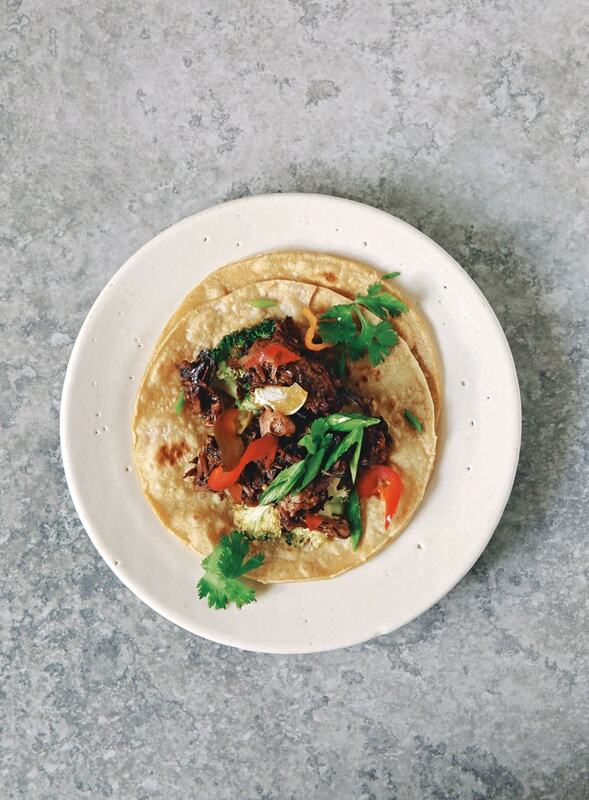 This technique is used in a number of recipes in the book, such as Caramelized Jackfruit Tacos. Uh, yum. Citrus. Use zest, juice and extract from lime, orange and lemon. Dried hot peppers. Rehydrate whole peppers or use them in the form of flakes or powder, which you can use in the recipes for harrisa and red curry paste. Fermented foods. Use ingredients like fermented black beans, kimchi (recipe included) and miso. Fresh hot peppers. Use peppers like jalapeno, Thai and serrano to create everything from a subtle kick to major fire. Nuts and Seeds. Toasting nuts and seeds to release their buttery flavour like in the recipes for Asian-flavoured Granola or Soy Pomegranate-Glaed Baby Eggplant with Dukkah. Pickled fruits and vegetables. Create extra dimension by using pickled ingredients like in the Pulled Jackfruit Rolls and Piri Piri Pizza. Pomegranate molasses. Recipe included in the book. Drizzle on sweet and savour dishes for tasty tartness. Spices. So many fun spices! Coriander, turmeric, sumac and more combined in ways that really take the dishes next level. Sauces and pastes. Try the Harrisa Paste, Gochujang Sauce and Fish-Free Sauce for adding an extra layer of tasty flavour to your meals. Umami-rich vegan ingredients. Umami is known as the fifth taste. It’s a signal for the savoury taste we experience from the foods we eat. Try the Sweet Potato Fries with Sriracha Ketchup, the Fu-mami Broth and Veggies, and the Homemade Kimchi. Umami-rich ingredients include balsamic vinegar, miso, mushrooms, nutritional yeast, potatoes and sweet potatoes, sauerkraut, tempeh, beer and wine and olives. The back of the book has a thorough explanation of all the amazing, flavourful ingredients used in the book to create bold flavours. YOu’ll learn about dried shitake powder,gochugaru, lapsang souchong, allepo pepper flakes, sambal olek, tamarind paste and more. I definitely got some great ideas by going through these ingredient list! Some of them were new to me and some I just completely forgot about. I can’t wait to make the Mushroom Dashi which is used throughout the book to bring extra umami flavour to the dishes. There’s also a Kombu Dashi I’m interested in trying. It’s made from kombu, or kelp, and can be used in all sorts of dishes for adding bold flavour. I’d never heard of gochugaru, a spicy, deeply flavoured Korean paste that sounds amazing, so I’m going to try that too! There are so many good sauce and condiment recipes, which I love because then I can create my own dishes but use these to take flavours up a notch. There’s a spicy citrus sauce that sounds awesome, a pineapple pepper jelly, teriyaki sauce, cashew spread, shichimi togarashi and serundeng, a Indonesian seasoned coconut mix that sounds so, so good. 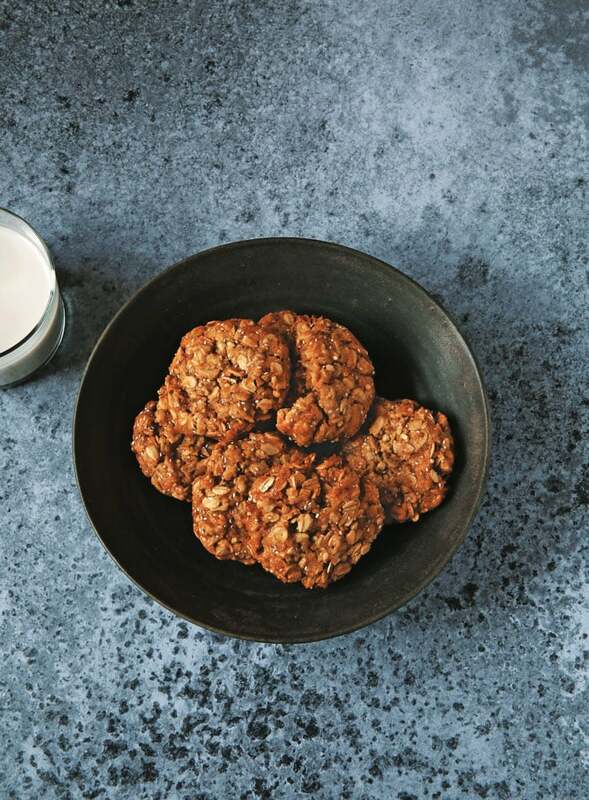 Here are some of the recipes from the book that are on my must-try list. You guys have to try this recipe. It was my favourite from the book because it’s so easy and the sauce is outstanding. 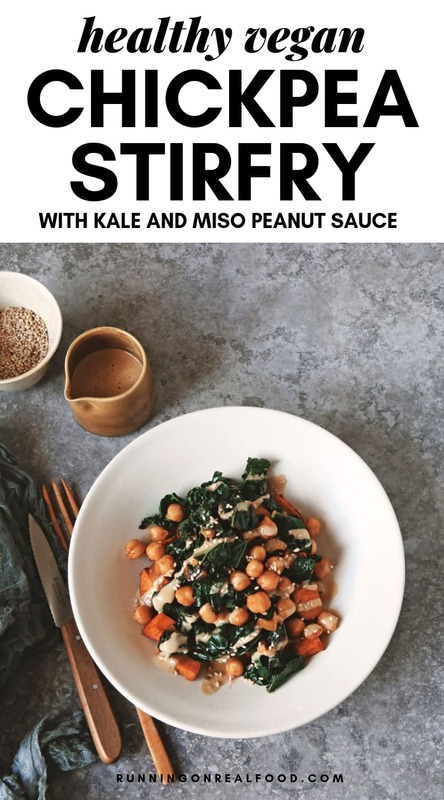 It’s a miso peanut sauce and it is so good and so easy to make, the whole recipe is easy to make actually. I’d recommend serving it over roasted sweet potatoes, as suggested in the book but you can also serve it with roasted vegetables, tofu, over rice or noodles or a baked potato. You can also just make the sauce and serve it with…everything. If you’re intersted in checking out Bold Flavoured Vegan Cooking, you can purchase it here. So quick and easy, this flavor-packed, smoky stir-fry is great served alone. It’s also a perfect match with roasted sweet potatoes to make for a colorful complete meal. While definitely good for you, this dish is quite a treat too. To make the kale and chickpeas, place the sesame oil, onion, chickpeas, garlic, salt, paprika and chipotle powder in a large skillet. Heat on medium-high and stir-fry until the onion is golden brown and fragrant, about 4 minutes. Be sure to stir frequently to prevent scorching. Add the kale and cook until wilted, about 2 minutes. Serve with potatoes on the side, and drizzle peanut sauce on top. If there are sauce leftovers, store them in an airtight container in the refrigerator. It tastes great on tofu bowls, baked potatoes and roasted vegetables. The dressing has some very delicious combination of ingredients. I cant wait to try this recipe for the weekend. It does not even seem very difficult to prepare. Looks awesome. I am all in to try it this weekend. 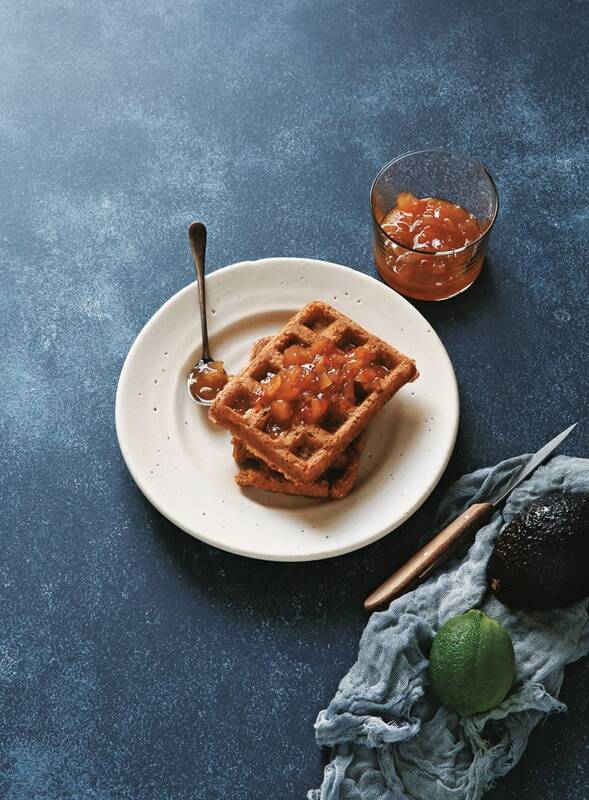 What’s the best alternate for peanut butter for drizzle? Any nut or seed butter should do the trick. I would recommend almond butter. Enjoy! Thanks. I’ll try it with almond butter. I didn’t have peanut butter and used almond butter. It was delicious. Absolutely delicious. It’s was very quick and full of flavors. I will certainly make this dish again. Awesome! So happy to hear that. Thanks for the feedback!! I must say this was outstanding. I have never tried any recipe you’ve posted that wasn’t DELISH.. Such great recipes and the variations you offer are tremendous. Made me wonder how long it takes you to write one post with the many options you suggest. OH SO GOOD ! My hubby still has not completely bought into a vegan diet but every time I make one of your recipes, he raves about the delicious flavors and combinations of textures. Yum! I did serve this a la Buddha bowl with roasted hubbard squash and couscous. Thank you so very much! Hearing that inspires me to keep sharing and creating, so I really appreciate it! So happy to hear you’ve enjoyed the recipes you’ve tried so far. That Buddha Bowl sounds so good! Amazing! Is this gluten free? Yes, it is. Hope you enjoy it.